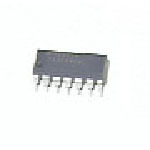 TTL logic gate IC as used in coil driver circuits on Williams solid-state games, lamp and switch driver circuits, and other applications. Common replacement part for failed coil driver circuits and common cause of stuck or non-functioning coils in many Williams games. Replaces TI # SN7408 and SN7408N.